The men’s field at this year’s Grand Prix of Figure Skating certainly lived up to its reputation as an unpredictable discipline. Throughout the series, the men had incredible highs and disappointing lows—sometimes in the same competition. Expect more of the same when the six Grand Prix Final of Figure Skating competitors step on the ice for the short in Barcelona, Spain on Thursday. Driving the unpredictable nature of the discipline are the multiple quadruple jumps, a must-have to be competitive in this men’s field. During the Grand Prix Final, the six finalists will make some two-dozen quad jump attempts over the course of the competition. When the jumps are successful, it creates wow moments and high scores. But when the risk fails, the competition is reduced to who makes the least mistakes. The wow moment of the Grand Prix series—and arguably for all of figure skating—goes to Yuzuru Hanyu of Japan, who skated two world-record breaking programs to win NHK Trophy. His score of 322.40 made him the first man to break—or rather smash—the 300-point overall score barrier. Perhaps such excellent performances should be expected from the reigning Olympic gold medalist. However, they came after a mixed performance for Hanyu at Skate Canada, where he lost to Canada’s Patrick Chan in their first head-to-head matchup since the 2014 Olympic Winter Games. Hanyu, who turned 21 today, shocked fans when he struggled on his jumps in his short program to Chopin’s “Ballade No. 1” and was in sixth place after that segment. He bounced back in the free skate going three for three on his planned quads. The skate was not without errors, which included a fall on a triple Lutz, but he was able to secure the sliver medal. The 2014 World Champion changed the “Ballade” short program for NHK Trophy, switching the triple Lutz-triple toe combination to a more difficult quad toe loop-triple toe loop combination and added a solo quad Salchow. Despite the increased difficulty, he turned in the best performance of that program, scoring 106.33 points, smashing the record he set during the Olympics in Sochi, Russia. Hanyu would top that performance with a flawless free skate to the soundtrack of “Seimei,” a Japanese film, that included three quads and all three of his jump combinations—a quad toe loop-triple toe loop, a triple Axel-single loop-triple Salchow and a triple Axel-double toe loop—in the second-half of the program. His free skate score of 216.07 was yet another record. If the two-time and defending champion could bring the same successful execution of these programs, a third consecutive Grand Prix Final title will be his. If not, there are several men who can take advantage of that opportunity. Look to Chan, the three-time World champion and reigning Olympic silver medalist, to challenge. He returned to the Grand Prix series after a year away and showed a bit of competition rust in both his Grand Prix events. At Skate Canada, he had a great start to his short program to “Mack the Knife” with a perfect quad toe loop-triple toe loop combination, but then errors on his two other jumping passes left him in second behind Japan’s Daisuke Murakami. The Canadian came back with a breathtaking “Chopin” free skate, however, it was not as technically difficult as Hanyu’s, and he landed one quad compared to Hanyu’s three. Nevertheless, Chan’s top-notch skating skills and intricate choreography provided the seven-time Canadian national champion high Grades of Execution (GOE) and Program Component Scores (PCS) that was enough for the win—in both the free skate and the competition. Chan’s short program struggles continued at Trophee Eric Bompard when he popped a quad-triple jump combination into a costly double-double, leading to a disappointing fifth place finish in that segment. Unfortunately, there was no opportunity to come back as the event was cancelled due to terrorist attacks that took place in Paris, France. The International Skating Union (ISU) opted to count the short program placement in distributing qualification points for the Grand Prix Final, putting Chan’s qualification prospects in jeopardy. However, after several skaters performed poorly at their second event—or improved from a poor result earlier in the season—Chan, 24, was able to secure a spot to the Final. The Skate Canada free skate shows why Chan is a top contender for the Grand Prix Final title, which would be his first since 2011. However, he may hand over that title if he continues to make mistakes like the ones he made in both his short programs during the Grand Prix series. While this competition could be set up as another head-to-head matchup between Hanyu and Chan, one must not forget Javier Fernández of Spain. The reigning World champion won Cup of China (COC) and the Rostelecom Cup (RC) to qualify for the top spot. Fernández, 24, shows a new side of himself with a sharp Spanish-themed short program to “Malaguena,” choreographed by Antonio Najarro, that should receive a high degree of reception from the home crowd in Barcelona. The three-time European champion has neither the skating quality of Chan nor the technical difficulty of Hanyu (though he has several quads planned over the course of this competition), but he has beaten both skaters when they have made mistakes. On the other hand, Fernández is also prone to silly, sometimes costly, mistakes. At Rostelecom Cup, he popped a planned quad Salchow into a triple, putting him in second place after the short behind rising Russian star Adian Pitkeev. Fernández was able to win the competition with a solid free skate, though it was not completely free of mistakes (he fell and popped his third planned quad jump, a Salchow). The Spaniard should be on the podium and a win is within his grasp, but the top contenders will need to keep an eye on the two rising teenage stars of this Grand Prix series: Shoma Uno of Japan and Boyang Jin of China. The Grand Prix Final marks a rematch for the two skaters, who both made their Grand Prix debuts this season. At last year’s World Junior Figure Skating Championships, Uno was victorious, though he struggled in the free skate, which Jin won. Uno, who turns 18 on Dec. 17, can execute difficult elements—such as a quad toe loop in the second half of both programs—with intricate choreography and difficult transitions. His confidence and attack helps him pull off programs that others would not, such as his short program to “Legends” by Sacred Spirts, a cross between country twang and electronica. Also, despite skating to a warhorse—“Nessun Dorma” and “Turandot”—for his free skate, the 2015 World Junior champion manages to get the audience standing when he hits the jumps and choreography. However, Uno has had moments of weakness, especially in his short program. At the U.S. International Figure Skating Classic earlier this season, he missed his quad toe loop and had an invalid element, placing a shocking ninth place in a field he was expected to dominate (he would win the free skate and place fifth overall). Uno again fell on the quad jump at Skate America and placed fourth after that segment, costing him the overall title (he again won the free skate). He finally skated a clean short program at Trophee Eric Bompard, and placed first after that segment. If the current Japanese silver medalist can deliver two clean skates at this competition—he was denied the opportunity at Trophee Eric Bompard when it was cancelled—a podium placement is possible, especially if top contenders make mistakes. Jin, 18, is making his mark in his debut senior season with the most ambitious technical content of all the men’s field. He is the first skater to ever land a quad Lutz-triple toe loop combination in international competition while competing at Cup of China. At NHK Trophy, his quad Lutz-triple toe loop scored a whopping 19.33 points, contributing to the second highest scoring short program (95.67 poitnts) in the Grand Prix—second only to Hanyu’s record-breaking skate. The 2015 World Junior silver medalist has an ambitious four-quad free skate, but he has yet to successfully execute all of them. At Cup of China, he fell on the quad Salchow. At NHK Trophy, he had a messy landing on that same jump and popped a planned quad toe loop in the second half of the program. However, Jin’s difficult technical content provides a buffer for mistakes—his technical elements score was still close to 100 points at Cup of China and just under 95 points at NHK Trophy. Jin stands to improve his overall skating quality and his choreography is clearly not at sophisticated nor as intricate as his veteran competitors and peers. Regardless, at NHK Trophy he showed that he could do more than jump with a sharp and sassy performance of his “Tango Amore” short program. However, in his free skate to “Dragon Racing,” the skater seems more focused, perhaps understandingly so, on the jumps. Jin can certainly contend for the podium if he successfully pulls off all the jumps, but the deficit in his program components scores means his competitors will likely have to make errors. Last season, Murakami, 24, surprised many when he won NHK Trophy after beating Hanyu and several top skaters. But as that was Murakami’s only Grand Prix event, he was unable to qualify for the Grand Prix Final. This Japanese dark horse, who became the first to land the quad Salchow jump in the men’s category at the 2011 Japan Championships, finally makes his first appearance to the Final after placing third at Skate Canada and third after the short program at Trophee Eric Bompard before the event was cancelled. Murakami has landed most of his quad Salchow attempts with a positive GOEs during the Grand Prix, but he leaves points on the table either by design—he does not attempt a triple toe loop, limiting the combinations he can include in programs—or due to error. During the short program at Trophee Eric Bompard, he popped a planned triple Lutz-triple loop into a triple Lutz-single toe loop, a costly mistake in an otherwise solid performance. Still, Murakami’s inclusion in this Final is a testament to his consistency in a deep Japanese men’s field. With Japan having just two spots at the 2016 World Figure Skating Championships, a good result here could provide Murakami the momentum to contend for one of those spots. 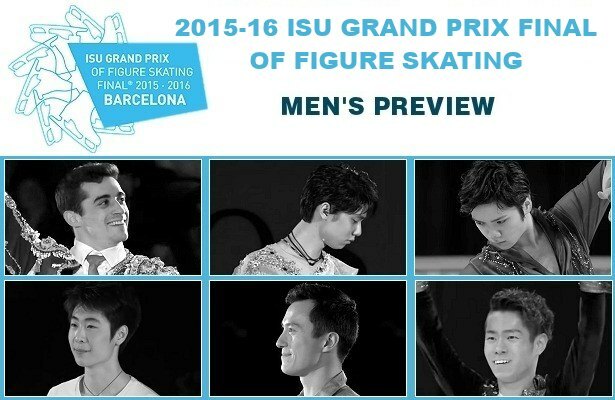 What’s your take on the Men’s qualifiers for the Grand Prix Final? Discuss here!